Pam Wye is a native Washingtonian with real estate running through her blood. The daughter of a general contractor, Pam returned to DC a decade ago, and jumped right into world of helping clients buy and sell homes. After eight years in the business, Pam has closed over 200 transactions, averaging $25 million in sales annually. 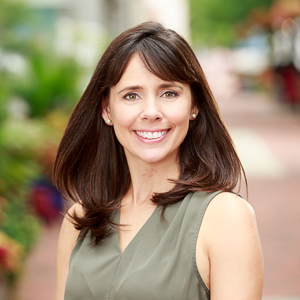 Pam specializes in neighborhoods across the city, including Capitol Hill, where she was born and raised, Logan Circle and Dupont Circle, areas she called home for five years, and Chevy Chase DC where she is raising her family. Pam truly enjoys opportunities to work all over the city including Kalorama, LeDroit Park, Brightwood, the Palisades, and Trinidad or, frankly, wherever her clients' needs take her. Pam is a firm believer that a strong knowledge of multiple neighborhoods and clients of all price ranges makes a well rounded real estate agent. Pam has achieved a high level of success in a short amount of time, and her clients say she packs a mean punch of expertise, market knowledge and exceptional service. She has incredible organizational skills and a fine tuned ability to help her clients understand a property within the context of a particular neighborhood and the DC area market. In 2011, Pam was recognized by Realtor Magazine as one of the “30 Agents Under 30”, chosen by GCAAR’s executive committee to be the 2011 Rookie of the Year, voted one of Washington City Paper’s best real estate agents, and included in Washingtonian's "Top Real Estate Agents" feature for several years. Pam is a former Vice President at TTR Sotheby’s International Realty, one of the youngest in the firm to receive the title for her sales record, and now is Vice President at Compass. Pam consistently works with several of the city's leading developers, including Ditto Residential, CAS Riegler, Monarch Urban and Property Alchemist, to represent their multi-unit and single-family home developments on the market. When Pam is not working, she treasures quality time with her family, particularly her husband (also a DC native) and two young boys, Mason who is 3 years old and Wyatt who is less than a year old. A favorite activity is spending an early weekend morning making breakfast with her kids. Pam is licensed in DC, MD, and VA. If you’re considering purchasing, selling, or investing, please contact her.